Two thirds of the City Council is calling on Mayor de Blasio to include funds for bike-share expansion in his 2018 budget. Officials at DOT and Citi Bike operator Motivate have said subsidies will be necessary to expand bike-share citywide. But earlier research by the Department of City Planning indicates that the bike-share system could quadruple in size and reach many low-income neighborhoods before any operating subsidies are needed. Citi Bike ridership is growing, and the system is set to expand to Harlem, Astoria, and Crown Heights this year. But it does not extend to many less affluent neighborhoods where it could be widely used, and there are no concrete plans to reach those parts of the city. In a January 3 letter to the mayor [PDF], the 34 council members commend the bike-share network for “its values as an [transportation] equalizer in New York City” and call on de Blasio to “advance a plan…to achieve your stated commitment to expand Citi Bike to all five boroughs.” Their position is buoyed by recent polling from Penn Schoen Berland Research, commissioned by Transportation Alternatives, which found 71 percent of NYC residents want to see bike-share expand to all five boroughs. In November, Motivate CEO Jay Walder and DOT Commissioner Polly Trottenberg told council members that a five-borough system would not be possible without city subsidies. Motivate did not reveal specifics about why its own finances are insufficient to support expansion. Rodriguez, who organized the letter to the mayor, declined to discuss financial details at today’s press conference. He said that the administration should hammer out the details with Motivate, and know that it has City Council support if the agreement requires subsidies. Blanketing the whole city with bike-share stations would cost about $400 million upfront, Motivate said in November, and such a system would need operating support. 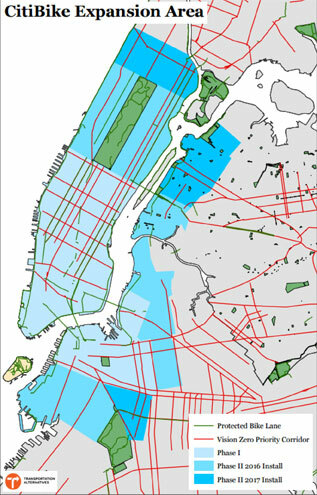 But many neighborhoods could be covered for less expense, and without large subsidies, if the expansion prioritizes denser, walkable areas in the Bronx, Queens, and Brooklyn. Many streets beyond the current bike-share zone also lack safe bike infrastructure. The T.A.-commissioned poll found that 69 percent of voters think new protected bike lanes should accompany bike-share expansion. “It’s irresponsible to expand Citi Bike without those life-saving safety improvements,” T.A. Executive Director Paul Steely White said. First: Good for Rodriguez and the other Council members who are willing to give funding to the expansion of bike share. Lander’s comment calling bike share a part of our transit network is most welcome. I know that Bloomberg chose to sell bike share as costing the City nothing. But our leaders need to stop pandering to the idiots who believe that all spending is by its nature bad. Each expenditure should of course be examined; but the concept of public money for a public good must be openly embraced. Second: Did Paul Steely White really call the expansion of bike share “irresponsible” if it goes to areas without bike lanes? Egad! Come on, man! No one loves bike lanes more than I do. Bike lanes have had a profound impact on me. They changed my relationship with my City; they altered my behaviour, turning me from a “Wild West-style” rider into a one who rides strictly legally as a means of protecting our bike lanes. But we musn’t exaggerate by saying that our streets are unbikeable without bike lanes. The more bike lanes, the better. But saying that is different from implying that bike lanes are a requirement to ride at all. The fact is that, right now, New York City is generally a great place to ride. I get that T.A. is an advocacy group. But it should not be distorting reality to fit its agenda (an agenda which I support). Here in New York, we are not trying to rescue a bad situation; we are trying to make a good situation even better. So, what I would call “irresponsible” is not the expansion of bike share into areas that have no bike lanes, but White’s comments which could discourage people from taking up bicycling, and which will be understood as saying that the only bikeable streets are those with bike lanes. Another misguided proposal with Brad Lander all over it. If Lander traveled outside his local neighborhood of the socialist republic of Park Slope, he may even find reality. Citibikes is another stupid program pushed by environmentalist who want to save the world but can’t even save themselves. More than half the people who use CitiBikes are tourists who shouldn’t be subsidized by the New York taxpayer. Most of the other half are Manhattanites who can afford to buy their own bikes. All these CitiBikes stations do, besides promoting Citibank, is to take away hundreds of scarce parking spaces which forces drivers to drive and drive around until their locate parking spaces – translation for Lander: THIS ADDS TO POLLUTION and if Lander doesn’t understand, this harms our environment more than it helps. And the Citibike program never does an environmental study before taking away our parking spaces. Lander and the other jerks on the city council have special license plates so they can park anyway and everywhere, a privilege others don’t have. Obviously Lander didn’t attend classes at the University of Chicago because if he did, he would understand economic reality. Like Lander’s proposal to nickel tax our free shopping bags. Lander, this actually harms our environment more than it helps. How? If we all use the canvass bags you advocate, these bags will rip after several months and wind up clogging our sewers – people will just toss them in the street – and add considerable waste to our landfill. There is a simple solution but you Brad Lander and DeBlasio, Juamme Williams, Stephen Levine, Liz Kruger are too stupid to consider it or they are jerk knee jerk liberals who don’t use common sense since as liberal politicians they have no common sense (like Anthony Weiner): Its called BIODEGRADABLE PLASTIC BAGS. Check it out and it will negate your plan for daily nickeling and diming New Yorkers with our shopping bags. I wonder whether a framework can be created to allow multiple operators to share the same system? Then we can have a bidding system. I agree, there’s a lot of ignorance of economic reality. Such as the fact that street parking spaces are a valuable commodity, and hence it’s insane for the city to just give them away. Metered parking on all streets in NYC. And charge more than neighborhood garages. U of Chicago teaches us not to undercut private enterprise. City Council transportation chair Ydanis Rodriguez is getting impatient. With the current phase of bike-share expansion set to wrap later this year, he's calling on City Hall and Citi Bike operator Motivate to seal the deal on a plan to bring bike-share to many more neighborhoods. The City Council is calling for two major transportation-related changes to Mayor de Blasio's budget: discount subway fares and Citi Bike expansion. NYC Subsidizes Lightly-Used Ferries. Why Not Hugely Popular Bike-Share?